December | 2014 | Love Those "Hands at Home"
make magic with our hands. I hope that 2015 is the most magical year yet for you! I’ve been dancing with one partner too long. My partner is suave and smooth but rather too insistent and demanding of my attention. He always wants to dance fast, and never to take a break, to sit one out. He has monopolized my time and kept me from others I care for. As of right now, my dance card is open. I’ve told chocolate to take a seat; I’m going to dance with other partners. 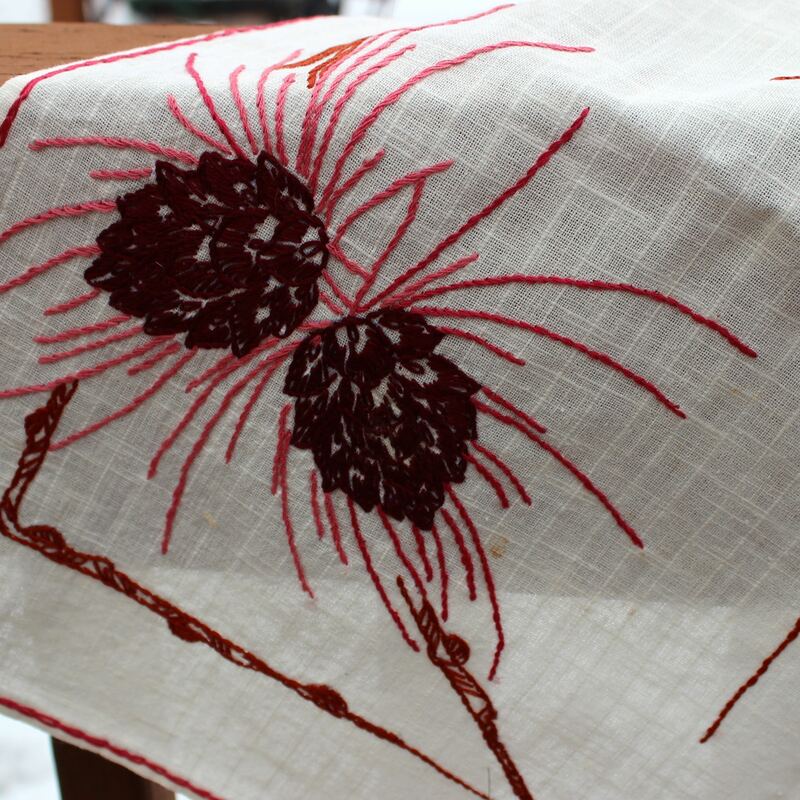 I’m going to dance with vintage linens and selling on Etsy. That dance—the ironing and photographing and listing of beautiful things—is soothing and reliable. It’s a slow dance, my partner is a bit of a plodder, but, with him, there will be no drama, just a warm and mellow twirl around the dance floor. That sounds good right now. I’m going to dance with quilting, my old, old friend. When we dance, I feel confident and skilled. We’ve danced together so long, it’s a pleasure to return to this partner. He knows my family, has danced with my foremothers. Dancing with him makes me feel nostalgic and at peace. That sounds good right now. I’m going to dance with blogging. I know myself well enough to see that I’m happiest when he gets a regular dance. I feel energized and creative after each and every dance and, because he’s very social, I get to spend time with old friends and meet new ones when he’s my partner. That sounds good right now. I’m going to dance with weaving. He’s not an easy partner but he’s very intriguing. I’ve been flirting with him for a while now, and have found him complicated and mysterious. He makes me stretch and learn new steps—I’m never bored with him. That sounds good right now. And I’m going to save some spots for partners I haven’t met yet, just in case. That sounds good right now. I know chocolate will be back. In fact, he asked me save the Valentine’s Day dance for him! I’m sure he’ll stop by before then, tap my current partner on the shoulder, and cut in briefly. There’s no doubt I’ll always be happy to see the smooth, old romantic and dance the quickstep again with him. On the light fantastick toe. I will dance with many partners. That sounds very, very good right now. Do you buy new ornaments every year and switch up your color theme? Do you have a white tinsel tree that channels the 1970s? Are your most-treasured ornaments those that your children made of pipe cleaners and marshmallows? Christmas trees, and holiday decorations, in general, seem autobiographical to me, as if our personalities are imprinted in our choices. And, I expect, a lack of holiday frippery sends a message about our priorities, too. It probably will come as no surprise that at home, here at Love Those Hands at Home, we tend toward the vintage, the handmade, the natural. I am in no way suggesting that our choices are the best or the prettiest or to be emulated—just that they are highly predictable, when you know the people who live here. The handmade ornaments will have to wait for another year to have their story told—I had not world enough or time to fit them in this year, alongside the candy and other priorities. But the red and white vintage linens have made their annual appearance, and they tell a large part of the story of who I am at the holidays. I value traditional, old-school, quality. 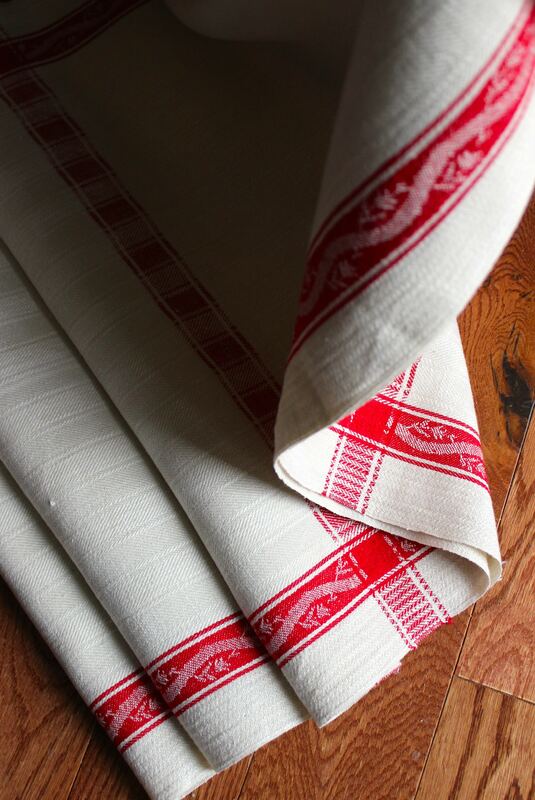 All the holiday linens in my permanent collection are red and white. 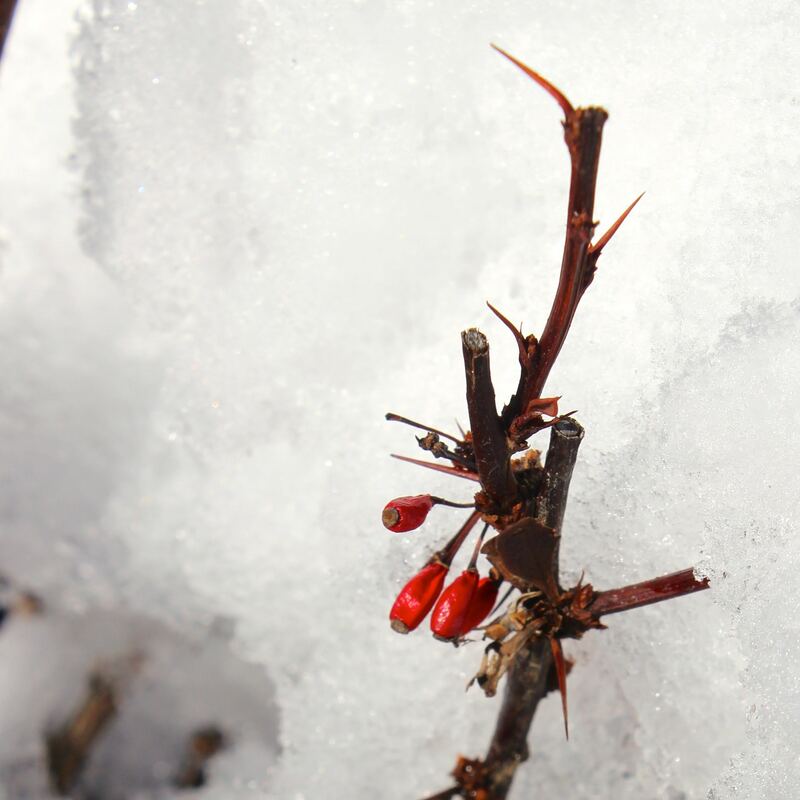 It’s the classic color combination of the winter holidays for me, evoking peppermint sticks and holly berries against the snow. It hints at Santa, an ideal of generosity and giving we can embrace, even if we don’t share points of view about miracle births in mangers. I love this long, long piece of fabric. It is heavy and sturdy, of fine quality. 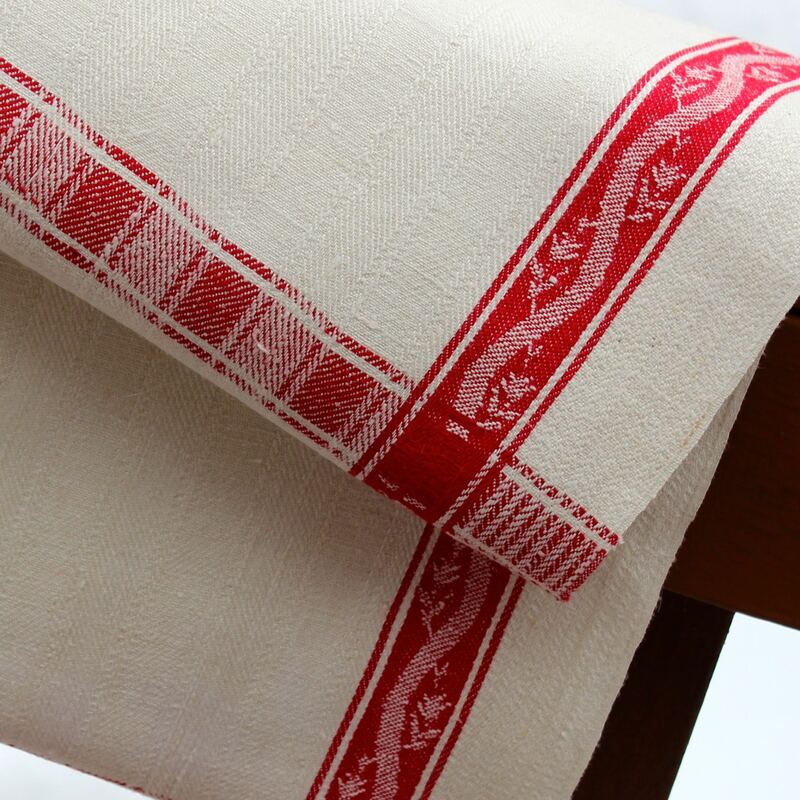 It was probably originally sold as yard goods–the pattern repeats regularly and, if cut and hemmed, each piece would be the size of a dishtowel. 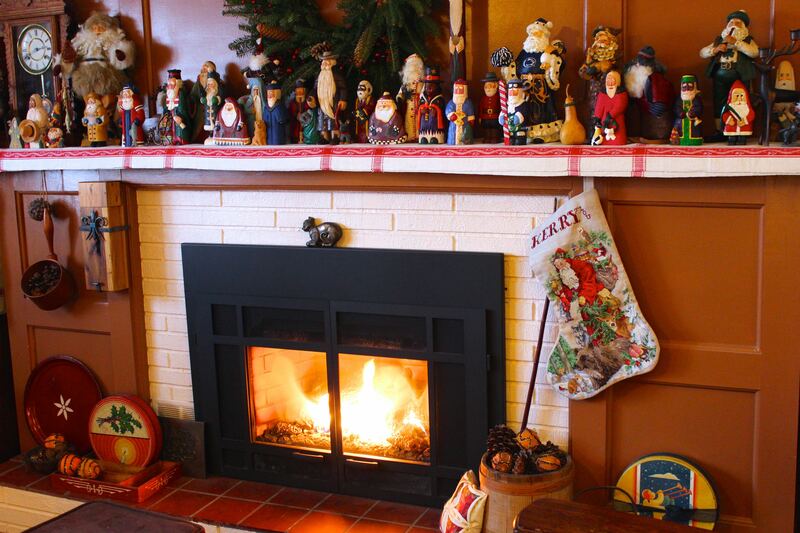 In its length and understated elegance, it serves as a mantel cloth here every year. 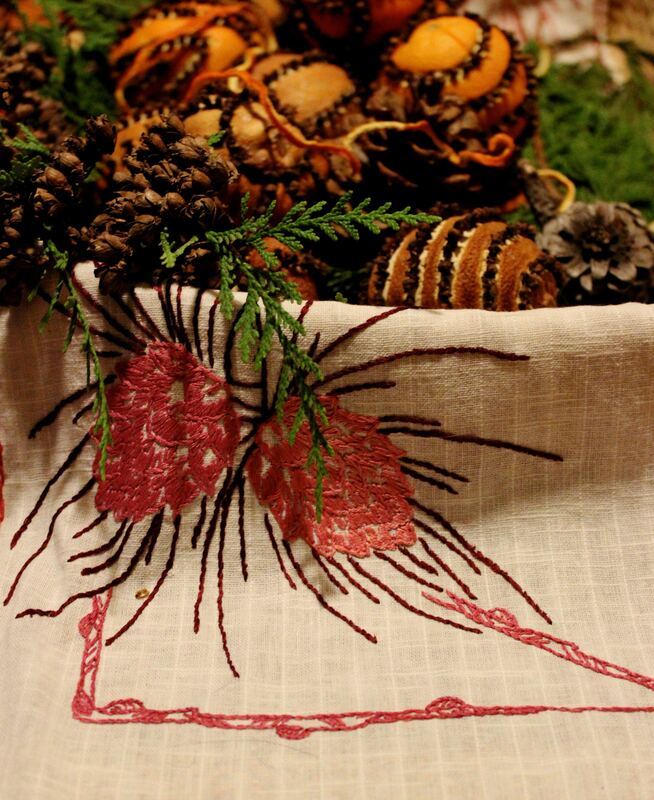 I love this hand-embroidered runner, with dark red and pink pinecones. It was made by hand, not by a family member of mine, but by someone’s mother or grandmother. 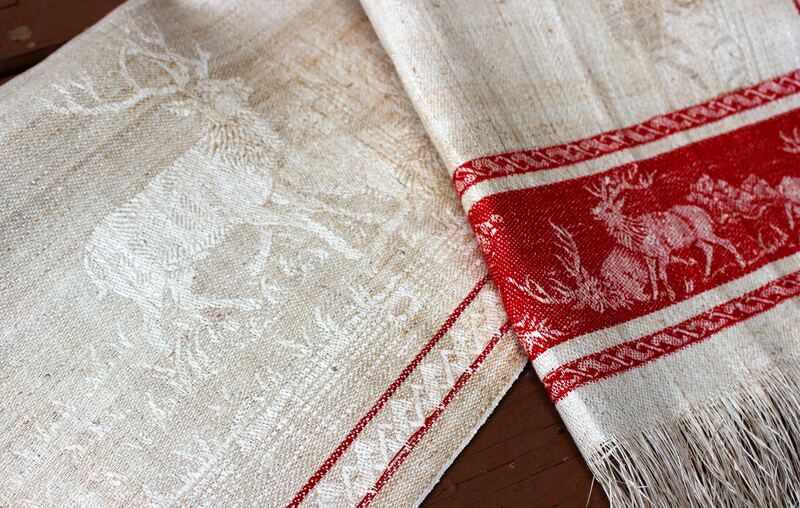 The careful work seems symbolic of all handwork done to add color and vivacity to plain cloth. And I love this exquisite show towel. It is ostentatious and would’ve been purchased and displayed, never used to dry hands, to make a statement about the wealth and superior taste of the owner. It’s not those characteristics of the towel that appeal to me, though. It is, simply, the quality and beauty. This towel is finest-quality linen, almost crispy, with a glorious sheen on the natural-colored fibers. The bands of red add interest and depth. The fringe is as showy and untangled as the day the towel was made. 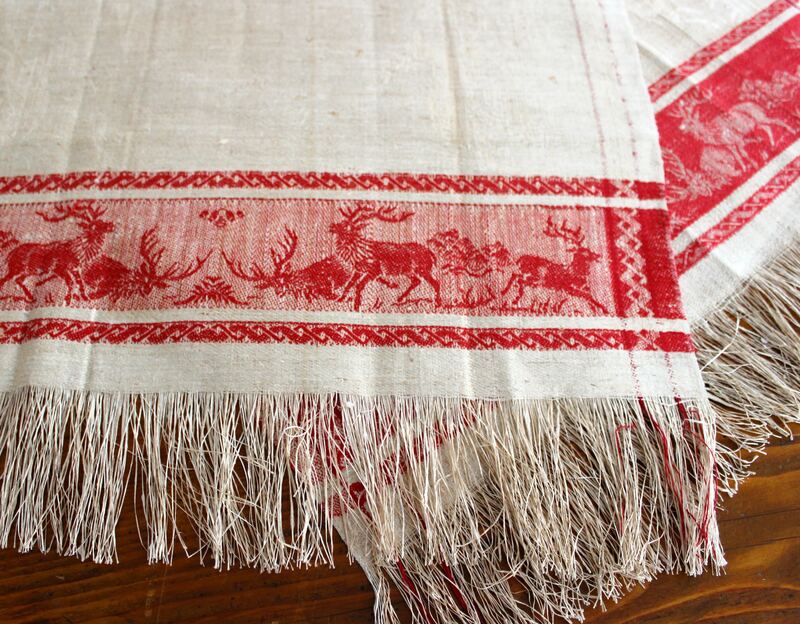 The intricate weaving shows wildlife, both in the red bands and, more subtly, in the tone-on-tone field of natural linen. Sheer vintage linen perfection. These linens come out every year, as reliably as the Christmas stocking my husband stitched for me and the wreath on the lighthouse outside. When they have been ironed and placed where they show to advantage, I feel my house reflects my taste and my values. Are there holiday decorations that communicate about your closely-held values? * This is to borrow liberally from Jean Anthelme Brillat-Savarin, who observed, “Tell me what you eat and I’ll tell you who you are.” I believe that is true, too! Say what you will about winter, about the cold and inconvenience and the lack of daylight hours. 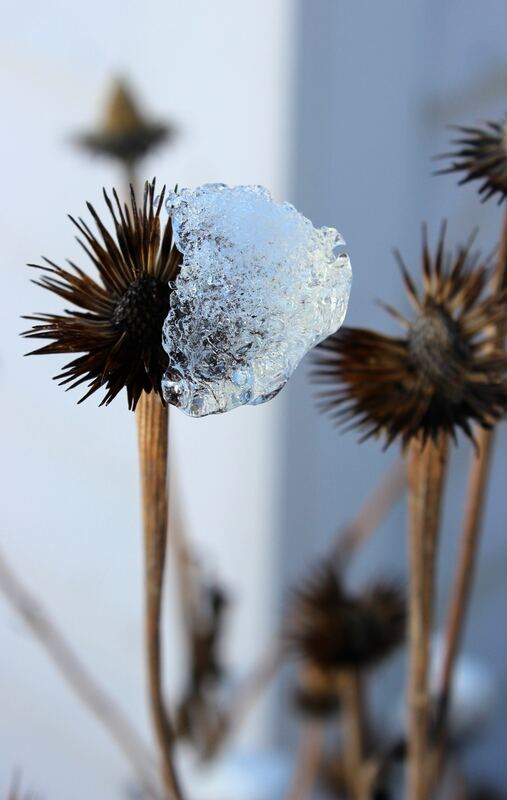 I still think winter provides more chances for dramatic and remarkable beauty than any other season. 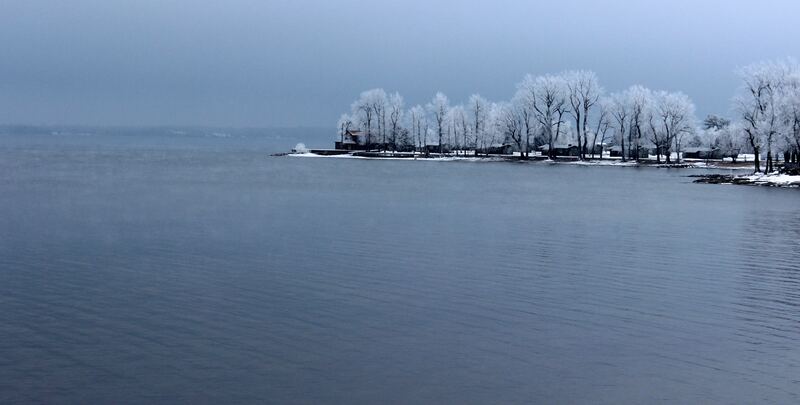 We know what the loveliness of the other seasons look like but only winter can provide the unusual spectacle of a swirling, freezing steam off a lake that is warm only when compared with the temperature of the air. And then, after a really cold night and a freezing fog, the world is covered in rime. It’s all subtle and monochromatic and understated and stunning. 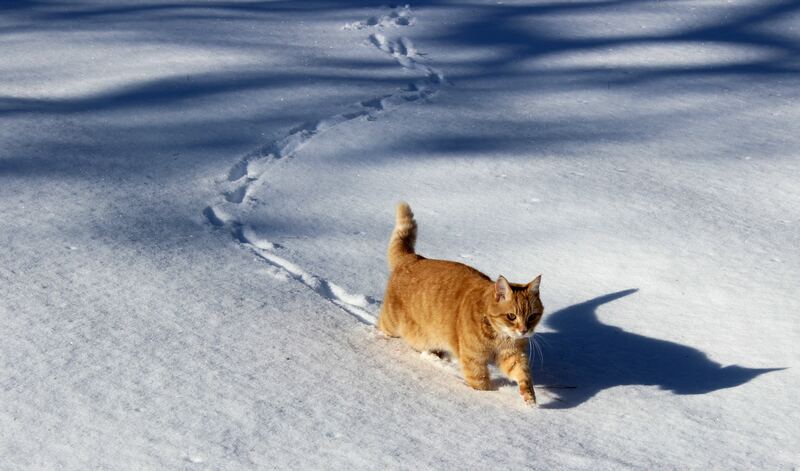 It’s winter–what will today bring? 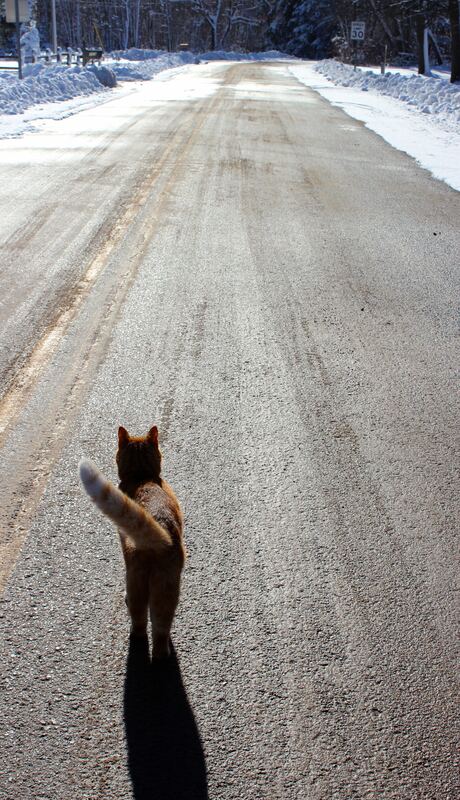 A nice walk can only help. 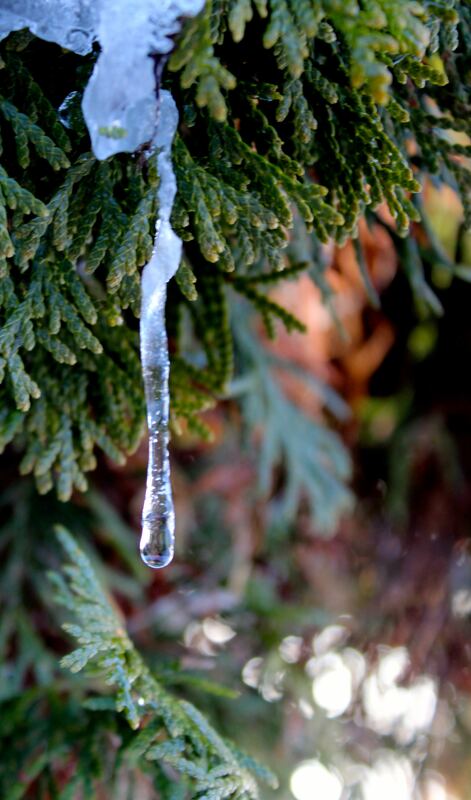 It’s already melting . . .
It’s time! Go get yourself some oranges and cloves, and create the most beautiful, holiday fragrance in your home! Have you ever been in a place where kindness means a whole lot to you, more so than usual? Feeling a little overwhelmed, a little harried, but then shored up by someone else and their kindness to you? I have been on the receiving end of a lot of kindness lately. For starters, while I was off selling candy at holiday boutiques this past week, my husband cleaned the entire house, from top to bottom! How’s that for nice?! I can, and have, thanked him in person but I want to thank three other kind people more publicly. First I need to mention my totally cool sister, Kit, who was my right-hand gal, yet again, while I sold candy at the boutiques. She helped last year and I will not EVER accept an invitation to one of these boutiques if she is unavailable or unwilling to help. My sister is mellow, even-tempered, and methodical about helping so I can just flap around and talk to customers! It doesn’t come as any surprise that I depend on her for this sort of help—she has been by my side, often literally but always figuratively, my entire life. I knew I could count on my sister’s kindness this past week but I was blind-sided by kindness from two other people, too—the antidote to feeling stressed and exhausted is nice people! Let’s take the kindness of a blog friend, Liz, who writes the blog, “food for fun.” Not only did Liz, a professional foodie, give me some great business and buy lots of candy from me, she wrote a really, REALLY nice blog post about the candy and shared some of her stash with others in the food industry. It is so reassuring to hear this kind of feedback from someone who is truly knowledgeable about food and the fact that she gave me the kind feedback so publicly . . . well, it doesn’t get any better than that! I saw Liz’s blog post at the end of a long and intense day of selling at one of the holiday boutiques. Those events are fun but exhausting for a hard-core introvert like me. However, when I saw what Liz had written I felt new again and ready to go back the next day, for the second boutique, with a spring in my step! I know you’d enjoy Liz’s blog as much as I do. It does what you’d expect a food blog to do—provide recipes and talk about food trends—but Liz writes with an honesty and humor that I find lacking in so many food blogs. Other food bloggers can make me feel like a schmo in the kitchen but Liz keeps it real and really fun. Plus she writes frequently about bourbon . . . and that means a lot to me! Jan is interested in sustainability—with a Ph.D. in ecology, I guess that’s not surprising. She recently finished an advanced program in permaculture and, as part of that process, made a masterpiece blanket that included her own crochet work, as well as crocheted and knitted blocks from blog friends around the world. When I whined to Jan that her mailbox must be a lot more fun than mine, she took it upon herself to change that! This is her modus operandi it seems . . . . When I returned home from my downstate selling extravaganza yesterday, I had an envelope from Wales waiting for me. 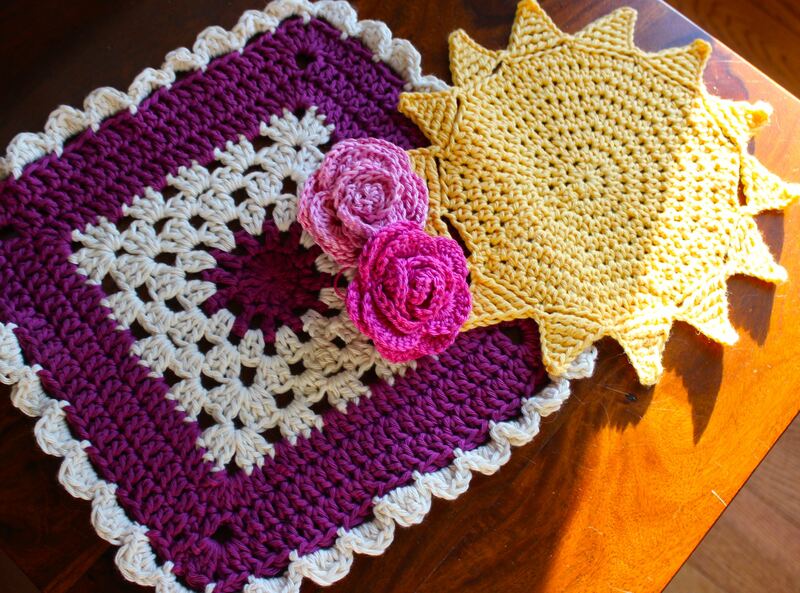 Jan had crocheted me a cotton ray of sunshine, some ever-blooming roses, and a big and beautiful cloth that she says is a dishcloth but that I can’t imagine ever using on dishes! I am pondering some ideas about how to use it, even as I write. Jan’s blog is another I’m confident you’ll love—in fact, I know many of you do follow it and are contributors to her masterpiece! If you haven’t checked The Snail of Happiness out yet, do so—Jan loves that which is handmade and she brings an intelligent, down-to-earth voice to her blog. All of this is an excellent reminder, at this time of year when we’re urged to buy big to show people we love them, that it is often the small, unexpected gestures that really matter and will brighten a day, lighten a load. I’ve been reminded of this important lesson by Kit and Liz and Jan, by being on the receiving end of their kindness. And I resolve to do more on the giving end as well.